While tired bargain hunters may think they've exhausted all their shopping possibilities by nightfall, a cluster of night vendors working outside Orussey Market may change their mind. At the end of a busy workday, businessmen and women pack up their wares and seal their day stalls to make room for night sellers, already unpacking small bags of snacks for hungry passersby. Folks tired from a long day at work or school often answer the call of a hungry stomach by stopping for a taste of noodle soup with beef, baby duck eggs, a mixed fruit shake, mixed sweet bread with meat or Chinese rice soup with pork. These foods and more can be bought from mobile venders crowding Phnom Penh's city streets, as well as in the provinces. The city offers countless sites for hungry travelers to stop for a rest and a bite to eat. Vendors crowding Charles De Gaule Street and Monivong Boulevard often cater to theatergoers after a night at the cinema. And both budding couples and long-term loves often take advantage of these moon-lit food stalls, transformed by the glittering street lights into romantic dining experience. The warm night air often proves to be too uncomfortable for Cambodians to enjoy an open-air dinner, sending many to seek shelter in an air-conditioned market. Wealthy Khmers and foreigners make frequent trips to supermarkets like Pencil, Lucky or Big-A to pick up needed groceries, buy presents for friends or simply peruse the shiny new items put on display. The price of products sold in these modern supermarkets is more expensive than those for sale in ordinary markets, yet shoppers still flood the narrow aisles in search of up-to-date items in a comfortable and clean setting. Many folks heading to Lucky or Big A want simply to try something new. A taste of a fast-food Lucky burger or a cake and fried chicken from BB World may be old news to travelers, but are new and exciting to Cambodians. The Soriya Mall and the Parkway Square Center also offer comfortable shopping experiences, providing high quality items in an air-conditioned environment. Watch out for the prices, though. They can reach as high as the tall ceilings if you do not bargain. The riverside makes for a beautiful backdrop to a night stroll following a memorable sunset. The fresh air blowing over the Tonle Sap cools even the sweatiest brow, as does a drink of iced coffee sipped while writing home at a local Internet shop. Vendors also flock to this riverside area, as well as to the Royal Palace front. More brave diners can sample the fare here, where Cambodians enjoy eating Lot Cha, cane juice, creepy insects and other delicacies including worms, grasshoppers and water beetles. A new development near the Naga Casino has recognized the riverfront's potential for growth. Considered an attractive gathering ground for families and friends, the large expanse of green stretching from Independent Monument to the casino often is crowded with fresh mangos, lotus fruits and rambutans, as well as people to eat them. Young couples also like to sample more personal treats, experimenting with a peck on the cheek or a handholding session. 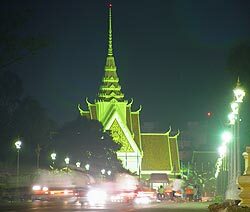 As the sun sets on Phnom Penh, don't let darkness blind your vision of all the city has to offer. Under the twinkling of stars and streetlights, memories are to be made eating local food and falling in love- with Cambodia.